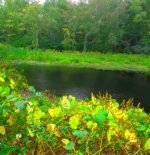 The Bates Lane Conservation Area's hiking trails lay in an area in Scituate that are considered to be in the west end section of Scituate. 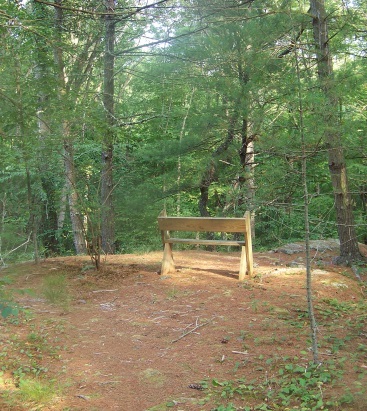 This area is a bit rustic, into the forest and off the beaten path of the usual route taken through Scituate. 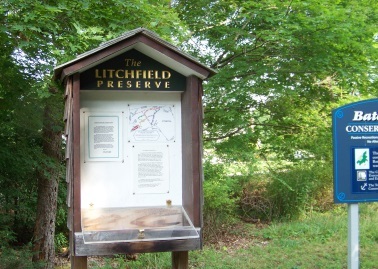 The conservation is located on Thomas Clapp Rd and has an affiliation with the Maxwell Conservation Trust and the Litchfield Conservation Area. The three form an association that is progressive in procuring and establishing new conservation areas in town. You will find the trails here well maintained, marked and an abundant use of weather protected maps to assure you of a journey well traveled. The area has two parking areas. 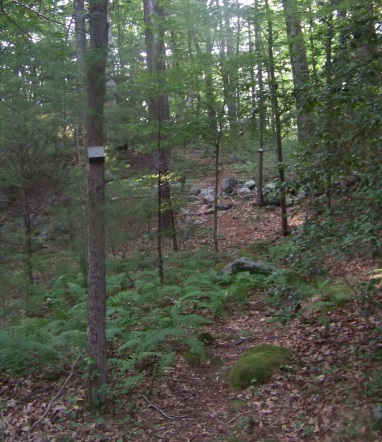 The more noticeable is where signs point to a parking lot and the trail for the Carl Pipes Memorial Trail. The parking lot looks to accommodate approximately 4 vehicles, that is when the neighbors haven't used them for other purposes. That seems to be a problem in a few areas that I have explored. Though this area seems to be little used there is usually space left for those who use the trails to park at. Parking at the lot, the trail is across the street and a short walk up the street. Turning right onto Bates Lane which appears to be a shared driveway, common in this area of the south shore. The gravel will turn to a grassy country road at the conservation entrance. 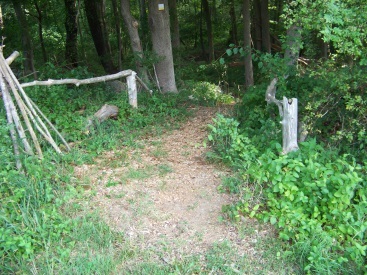 Here you will find the junction of the Carl Pipes Memorial Trail. Bates Lane will continue straight as a trail from this junction. 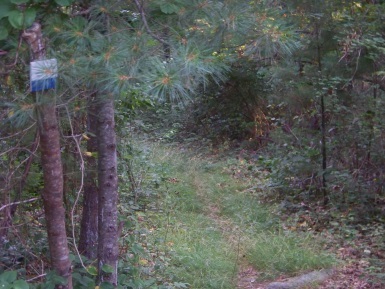 This hiking trail is marked in blue. Once on the trail though you will only find markers in plain white. The colors are only displayed at trail beginnings and ends and any junctions in between. 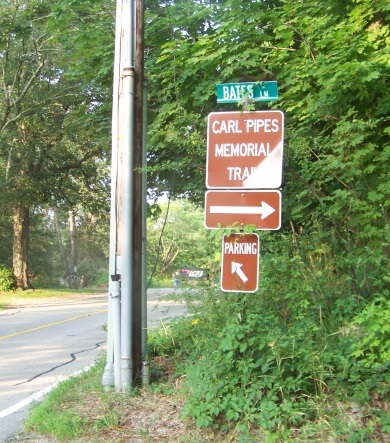 At this first intersection, the Carl Pipes Trail takes a right. It starts as a true trail. Just wide enough to not get brushed by growth on the side of the trail, yet the trail has a fair amount of long grass to travel over to make ticks a concern. 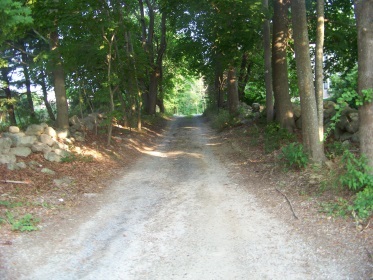 The way is level and clear till at just before 1/2 mile the intersection with the Moncy trail which goes to the left. No map but you will find the first of many well made benches. After this junction the trail continues with a slight descent and will become somewhat rocky. Shortly after the trail will ascend but more noticeably than it's descent was. 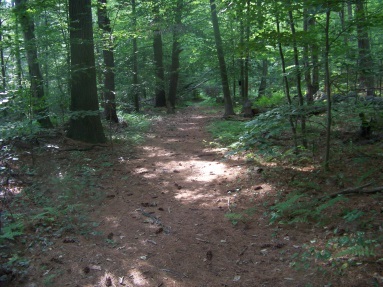 About the time the trail crests it's height, the cut off trail will lead to the left. Here you will find another map to check your location. 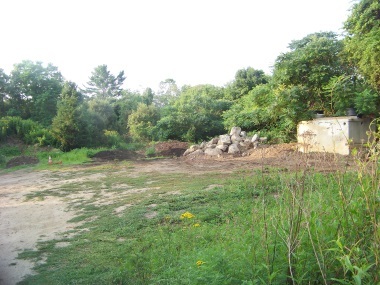 The Cut Off trail will cut off a tip of the Carl Pipes Trail and will lead to the side of a bridge through a rough spot in the conservation area. 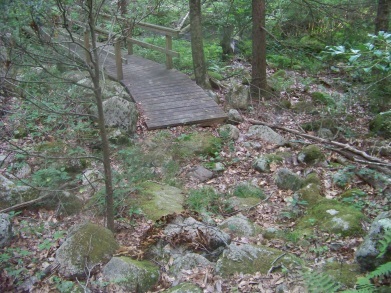 It is a bit rugged on the end where it meets this bridge which is on the Maxwell trail. If you stay on the Carl Pipes Trail it also will start to descend after the junction with the cut off trail. 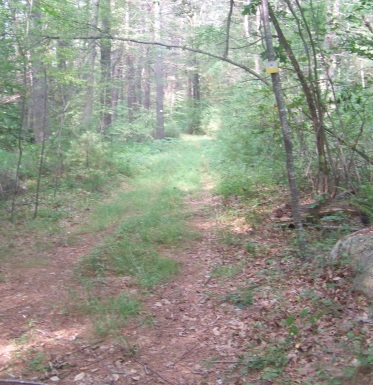 At 3/4 mile it intersects with the Maxwell trail and takes a left. 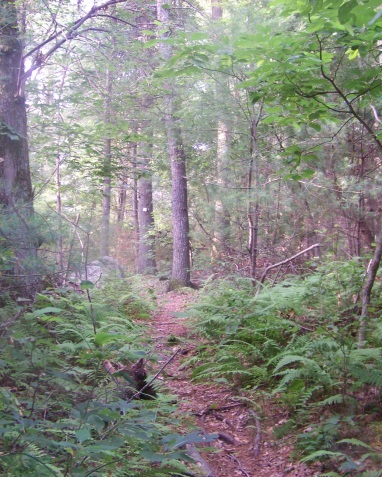 There is a trail leading to the right but it leads off the conservation property and goes to the rod and gun club which has no public access. Another map can be found at this intersection. The Maxwell trail is marked in orange. You will now find the trail becoming once again rocky. 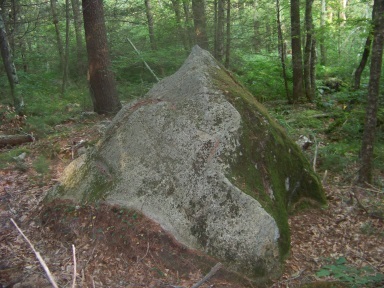 The information on the trail calls this glacial till. 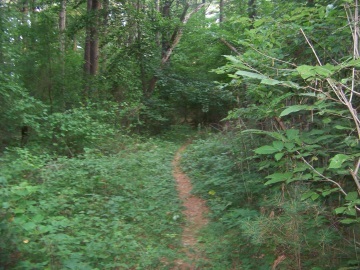 At just under one mile the trail runs alongside a hill. 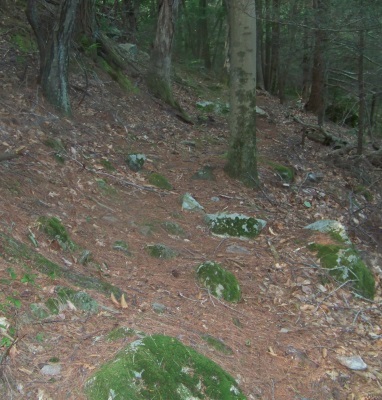 This trail can be almost considered rugged due to the rocks and hillside travel. Soon the other end of the cut off trail intersects the Maxwell trail. This trail is marked in black. It is an interesting trail. I used it as a side trail and of course had to explore. It passes through two stone walls and due to the steepness of the end section you will get a good short strenuous leg workout using this trail. Just after this, you will pass over a bridge that eases you through a difficult area that is extremely rocky. At other times of the year there is a flowing brook that may have been difficult to cross before the bridge was built. In mid summer it is only a mud hole (one that I'm glad a bridge crosses). 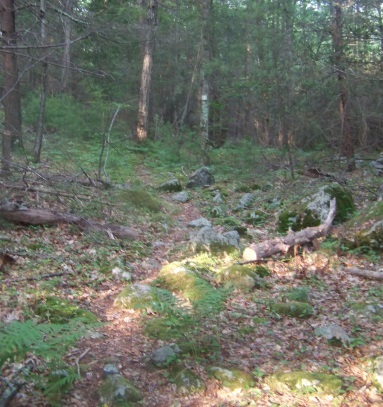 The trail continues fairly narrow and picking through more rocky area. At about 1 1/10 miles the trail now climbs moderately. Another short somewhat strenuous leg stretch. At the top the trail splits. Going to the right brings you to another bench sitting atop a boulder. Nice place to rest and view a bit of scenery from above. Maybe even catch a glimpse of one of the many deer residing on the conservation property! The trail continues at this split to the left. 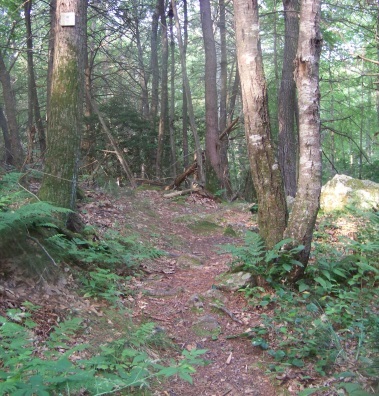 It then enters an area where a new trail was made. A sign that has folded to the winter weather (presumably) asks the hiker to follow the new trail. No explanation but I will tell you it is due to a large amount of fallen trees that have blocked the route. Soon after the two trails meet. At another 1/4 mile another intersection with the other end of the Bates Lane Trail marked in red. Take a left to complete the loop back to your car. There are trails to the right. One fades off and the other leads into a neighborhood. 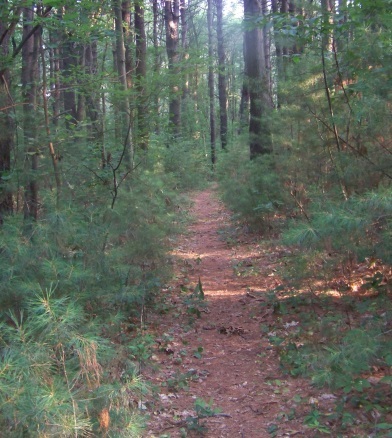 Taking the left will bring you to the intersection of the Horse Trail at just short of 1 1/2 mile mark of this route. 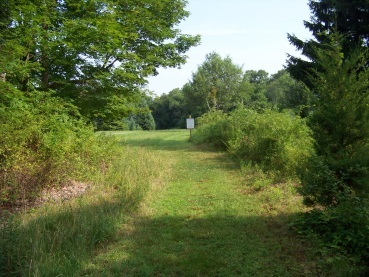 The Horse Trail leads to the right and is marked in green. This was the only trail I did not explore. 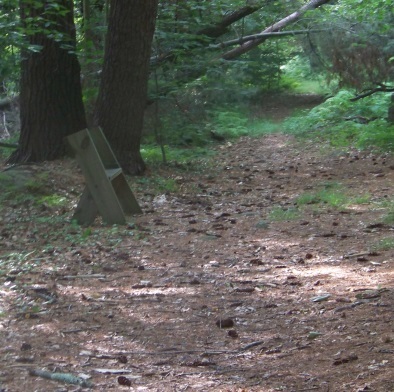 Another map and bench are at this hiking trail junction. Just after, the other end of the Moncy trail will intersect from the left. This trail is marked in peach/pink. For some reason the Moncy and Cut Off Trails are not marked in their colors on the Carl Pipes Trail?? will lead off to the right. the far end of the Horse Trail. 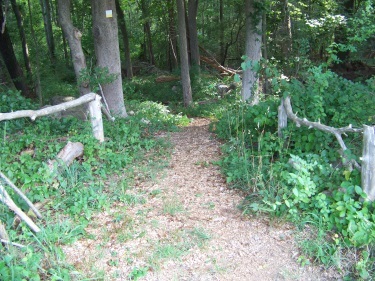 A very welcoming entrance into the Bates Lane Conservation Area! Directions: from route 3A north enter Scituate. At the 2nd blinking yellow light take a right on Booth Hill Rd. Follow to the end and take a right on Thomas Clapp Rd. Shortly down the road signs pointing to the Bates Lane parking lead you to a small parking area on the left. Continuing on Clapp Rd. at the intersection with Cedar St. at the fork the Mt. 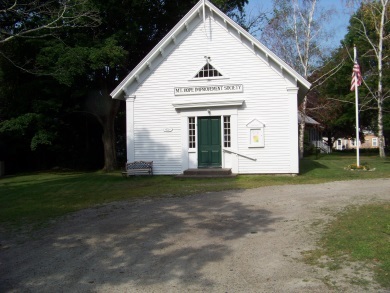 Hope Improvement Society building sits with parking to access the Litchfield Preserve portion of Bates Conservation. 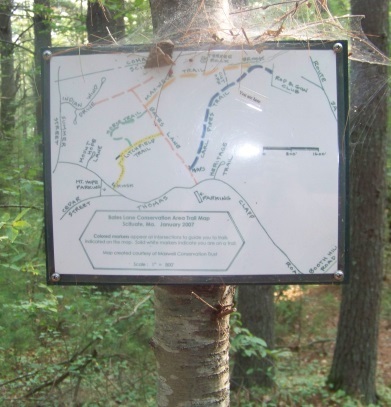 This map is from historic scituate trails lots of good info here on other Scituate trails.